Just four healthy ingredients are needed to whip up these dense, fudgy chocolate brownies which boast a hefty dose of protein! Dark, rich and subtly sweet, depending on the size you cut them, pack in over 15 grams of protein per serving! Naturally gluten free, vegan, paleo and refined sugar free! Hey guys! I’m so excited to announce some exciting news- I’m continuing my collaboration with Kohl’s for this coming quarter! I was thrilled that many of you guys appreciated the healthy back to school and college dorm room snack recipes I shared last time. Now that we’re entering the colder seasons, snacking and healthy meals are something imperative to ensure optimum health. For this quarter, I’m going to be sharing healthy snacks and lightened up treats which are healthy but DON’T sacrifice on taste. Based on my feedback from the last campaign, you guys really appreciated the quick and easy snacks, especially those with an added protein boost. 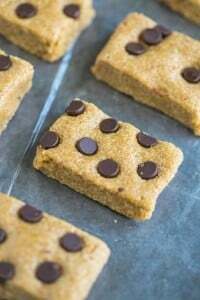 For my first recipe in this series, I’d love to share one of my favorite healthy snacks which taste absolutely decadent but are insanely healthy AND pack a protein punch. When it comes to using protein powder in baked goods, you need to be incredibly careful as to what brand, type and consistency you use. I must admit, I’ve had MANY failures in which the successful result was achieved by simply replacing the protein powder used. There is the assumption that baking with protein powder results in hockey pucks or a hot (non-edible) mess. I trialled this with 3 different types-A paleo protein powder, a vegan protein powder and my favorite casein protein powder. What is pictured is using the vegan brown rice blend which, when paired with this pan from Kohl’s, produced these delicious brownies. I also attest the combination of these two for the puuuuuuurty crackly tops of the brownies which makes us all swoon! So how about the recipe then? 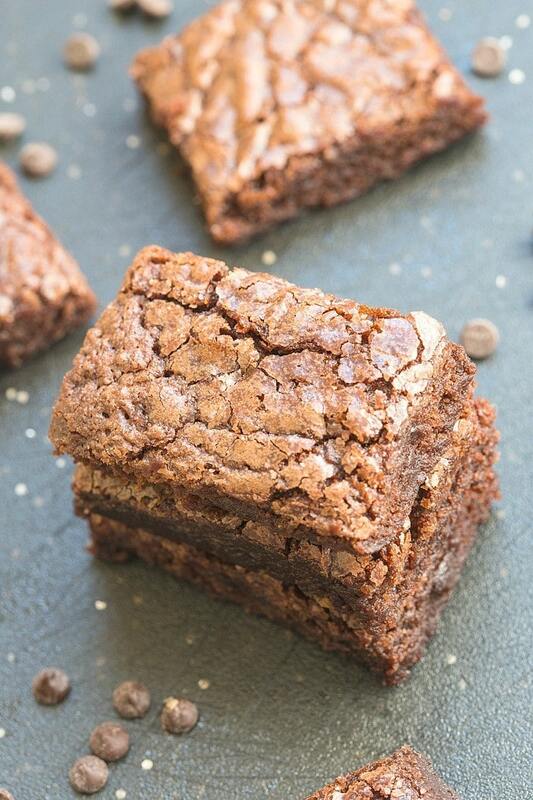 These flourless protein brownies need just four ingredients to whip up! They are rich, soft and decadent, you’d be fooled into thinking they were actually healthy! 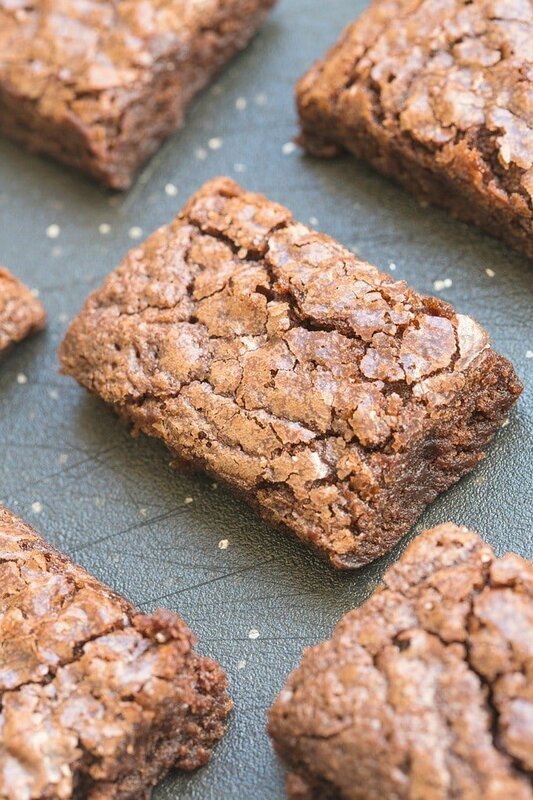 Unlike traditional brownies, these contain no butter, flour, sugar or oil. Instead, a combination of mashed fruit, nut butter and protein powder give it the extremely dense and creamy texture! These flourless protein brownies are low calorie, vegan, gluten free and if you use the paleo protein powder, completely paleo friendly too! HACK! I know I sound like a broken record, but these taste 200% more amazing once cooled and refrigerated. I swear they get so much more dense and fudgy, it takes it to another level! Make these delicious four ingredient flourless protein brownies and join Kohl’s and I in celebrating their #makeyourmove campaign. In a blender, food processor, or using your hands, combine the bananas, cocoa powder, protein powder and nut butter until smooth. * I do NOT recommend whey protein powder- It lends itself to a gummy texture. These brownies are not super sweet, as the protein powders used all had sweetener in them. Adjust accordingly if you'd like a very sweet brownie. Want more lightened up treats and snacks? Gotcha covered! Cheers, hugs and handshakes for supporting the brands and companies which allow me to share what I love to do everyday! Do you have a Kohl’s department store near you? Brownies with crackling topping > Brownies without. Truth. Hi Amy! For sure- If you add the ingredients into myfitnesspal and then divide it by the number of brownies, it will provide it for you! 🙂 Enjoy! Yay- I loved the originals, but these crinkle tops are my favorite thing to see on a brownie. I wonder if my soy protein would work? I’m so clueless when it comes to protein powder. .
I’m going to try my Arbonne protein powder (that’s what I searched in Pinterest for this to pop up), I know they use brown rice and pea protein so fingers crossed!!! I’ll be making them with my almost four year old daughter! I am using Arbonne as well so this is great to know! I actually haven’t used mine in a shake yet because its so perfect for baked goods. Thanks for sharing! Ugh, I want these right meow. And YAY KOHL’S. You rock. Oh my gosh I want these like now!! Brownies without cracked topping just aren’t brownies! I really should try this refrigerator trick of yours…you’ve been loving on that lately! Brownies for the win! Can I have brownies for breakfast? YES! Seriously, they have this amazing richness, denseness, awesomesauce? I love that these aren’t super sweet and Riley loves brownies. I wonder how I could make them and convince him that they’re bad for you? That’s the only way he’ll think dessert tastes good. I haven’t eat breakfast yet and now I’m craving brownies. These look perfect and I love a good brownie from the fridge! Right? Thanks so much, Megan! Wow these look exactly like regular brownies. At first I had a hard time believing that they were flourless. They are so good, Emily! Arman you had me at brownies – love this simple recipe – and I seriously can’t believe these are no flourless – amazing! Those crackly tops are perfection! Do they taste like the almond butter at all? If so, I’m absolutely sold on them! Holy shiitake balls, these look insane!! 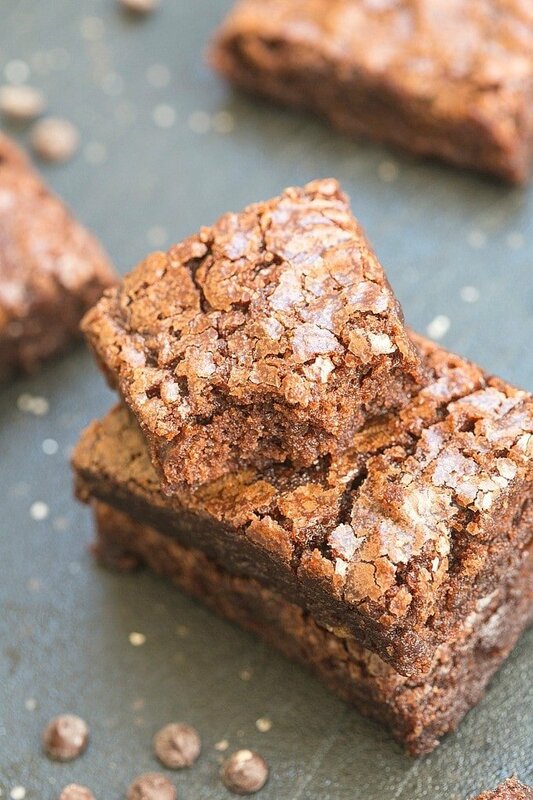 Those crackly tops are wha brownie dreams are made of. I can’t believe they don’t have any refined sugar or eggs! I’m telling you, you’re a magician. Those are the most perfect looking protein brownies I have ever seen. I am making these tomorrow, pronto! Can’t wait to take them to the gym to share. 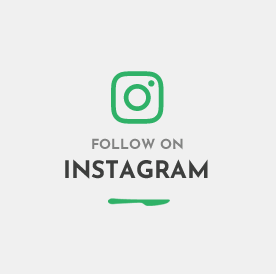 Haven’t been here for a little while, and I’m shocked how many good things you’ve made and posted (and presumably eaten) #totallyjealous Well done, Arman! Okay, it’s not that your other recipes hadn’t looked good, too, but this one takes the cake, no, brownie ;). For years, I assumed the crackly crust was the result of the caramelized sugars from the refined kind and melted chocolate in traditional recipes. And now you’re giving proof caramelized banana sugar is working this magic, too?! I’m impressed. Did it take you a lot of trials to get the results you were going for here? You bet- I tried 3-4 different protein powder types before delving into different protein powder brands before succeeding- Others have tried it and it’s worked, but only a handful produce the crackly tops! Which type and brand of protein did you like best? I can’t believe these don’t have flour or eggs in! They look so good! I just made these and they are very good! I made mine with a vegan protein (Vega brand) and didn’t get the crackle. I think to get the crackle top, everyone would have to use the same type of powder you did. Still delicious, though! Laura! that is so bizarre, do Vega make different types of protein? One reader made it and had the crackly tops- Dang! I love brownies with crackly tops!!! I’m not really a protein powder person. I think it’s because most of them smell kind of weird haha. But your protein snacks always look SO good! Thanks buddy. I’d eat kale for you. These brownies look yummylicious! I think adding some cacao nibs to the batter would be good, too! the chewier, the better!! HOW did you get these brownies to look like the sugar, butter, flour-laden ones?! Must. Try. Brownies with crackly tops ALWAYS. And no nuts. And everything tastes better from the fridge. Except maybe coffee — give it to me hot. YES. You’re like my mum and I. HOT HOT HOT. The crackly tops are my favorite part. I just found your blog (literally 20 minutes ago) and there’s already so many recipes I want to try. I’m gonna start with these though. They look magical. Yummy! Just finished baking these 🙂 I added some walnuts on top! YAY! I’m so glad to hear that, Amy! Am I correct in seeing that the pan needed for this is the 7″ x 11″ pan? I have an 8″ x 8″. Would that work? HI! I’m thinking of trying this with the hemp protein powder I use. How much would you say ‘2 scoops’ is for someone who doesn’t have that protein powder scoop? ? Thanks!! any idea how many tablespoons? We have whey protein available in our local bulk food store. Hi Erin! I’m not sure, I’m sorry- The scoop is 34 grams if that helps! 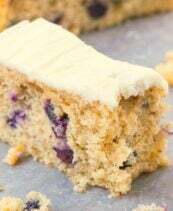 I find brown rice protein powder to lend the BEST texture in baking! So delicious and fluffy! But WHY OH WHY OH WHY do I have to wait overnight for the best results?!?!?! BOOOOO! LOL just kidding but I am not patient when it comes to these things! Will definitely make this recipe! hi! how many does this make?! Did you use chocolate protein powder? What protein powder did you use and where could I get it? Did you mix the three together in equal amounts or did the recipe work with all the brands separately? Hi J, no I tried it each time with each brand individually. Your recipes look amazing. Unfortunately many of them claI’m to be Paleo on pinter est but they are not. There are no grains on Paleo. It’s a bit misleading. Hi Pam! that’s correct- That’s why I used both cashew butter and almond butter and for those who don’t follow a paleo diet, can enjoy it with peanut butter! Cheers! Hi Jessica! I haven’t personally tried it with coconut oil but you could try- Does she like Sunbutter or cashew butter? I think I speak for everyone, ok, I speak for me, when I say you and your recipes are the answers to our prayers/wishes/miscellaneous meditations :). I made the flourless pumpkin blondies and they were the perfect light dessert for Thanksgiving. I am definitely going to make these very soon. Definitely. I made your brownies today, 4 ingred, but added an egg for protein and to make them more cakey. They are super dry, do you think the egg did that, or what ingred should I increase for moistness? Darn! I have a banana sensativity. Any thoughts on something to substitute? Great idea! I’ll try it. Thank you! These look amazing! I love brownies. These look so amazing. I love how the recipe only has 4 ingredients!!!! 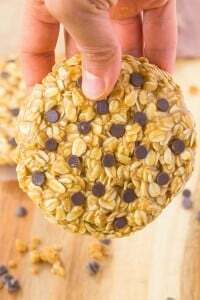 I would love to try these with a different protein powder as I avoid anything with soy. I used a blend of hemp and pea protein powders and didn’t get the crackly topping. They smell great and they’re cooling now! I can’t wait. I’ll try out the rice protein powder next time. Thanks for a great recipe! You are so welcome, Michelle- I’ve never tried it with that protein powder blend but I’m intrigued! 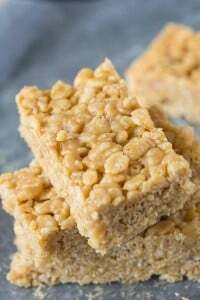 Anyone try making these without protein powder? I have everything in the house except that! These were delicious. I used chocolate vega protein. My kids loved these. I didn’t need to melt the pb though and I just mixed it by hand because I was too lazy to clean my blender. They turned out great. Thanks for the recipe!! Which Vega blend did you use? I made this recipe for two reasons, it was the top Google choice and I had all the ingredients. Holy tasty brownie batman!!! Not only was it great out of the oven but it kept getting tastier in the fridge. I will try all of your recipes now! I have a horrible sweet tooth that leads to bingeing; these satisfy my sweetness and fill me up. Thank you so much!!!! Must make ASAP! How many servings did you get? I ran the numbers using 2 scoops Sunwarrior protein powder and found I can only make 5 servings to get 15g protein per brownie. I might just make 6 or 7 to get a few more out of it. Can’t wait to try. Any substitute fo protein powder pls. How do you think the Orgain Organic Protein plant based powder would work (in creamy chocolate fudge)? That’s the only one I have, it has sprouted brown rice protein, chia protein, hemp protein, and fiber. 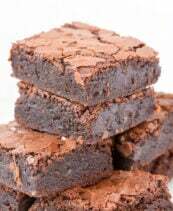 Brownies are my life, but I don’t want one’s with all the sugar or the super hard healthy recipes I can find online, but your brownies sound perfect! If you’re allergic to nuts what can substitute the peanut butter? If I wanted to feed this to my son and leave the protein powder out, would it still cook just the same? Hi Arman, I made this with Nature’s Plus Spirutein protein powder, chocolate flavor (though heat kills the spirulina) and they came out great. Thanks! Do you have any idea what the nutritional facts are for this one? Do you think you could sub coconut or almond flour for the protein powder? I’ve just started a paleo-ish diet and I don’t have protein powder thanks! Made these for dinner last night. 🙂 They were a hit (why would they not be?). 😀 Thanks SO much for the feedback, Raia! 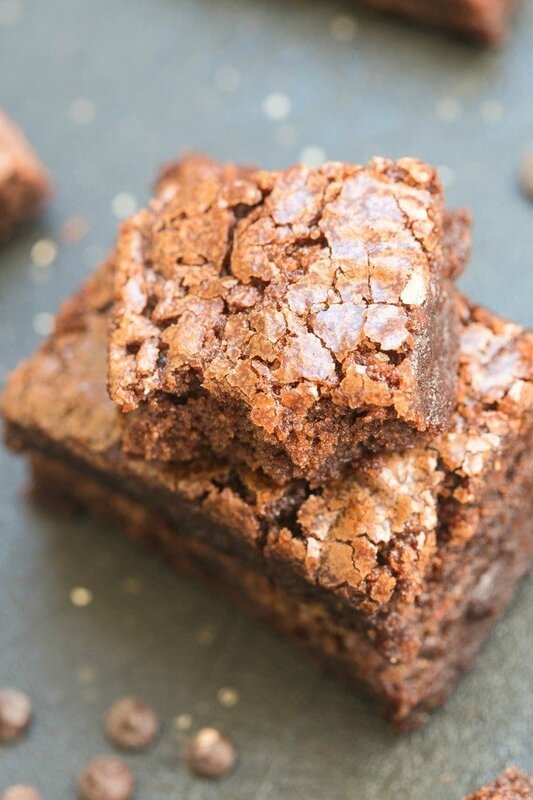 Which protein powder makes the brownies look like the picture? Hi Kelly! I’ve used several casein protein powder brands which I’ve found to give it the crackly top. Readers have sent in photos/tagged their creations on Instagram using Vega protein powder which produces the same result! Hi Rebekkah! I haven’t tried it with brown rice flour but you can try my 3 ingredient blender brownies- They don’t need any flour 🙂 The vegan brown rice works REALLY well- Others really enjoy vega protein too! So I just read a comment from you a couple of comments up from mine which makes me think you used casein protein powder in the ones pictured. But in the post you say you used the brown rice one. Using casein protein powder would explain the volume and crinkle top that were not achieved when I used your brand of brown rice protein. OH my gosh I can’t wait to try some of your recipes!! Thank you for taking the time to post these! Now, if they could just be calorie free…? Hahahahaha Karin. We could then have a Ben and Jerry’s party. These look delicious! I know you said no whey protein powder but will the result be awful if I use it? Ah ok! I have a feeling that’ll probably happen. I’ll try it and let you know! Just made these, here is my nutrition estimate from a 8×8 pan, 9servings—YMMV 110cal, 6carbs,6protein. I used half almond butter/half pnut butter because I had about half the required almond butter that I needed to use up. This recipe is a saver. OH and I added about 3T choc chips. Thanks for the feedback, Sharon 🙂 Half almond/half peanut butter sounds delicious! Is shakeology considered a whey protein – would it work for this recipe? I have a bag I got burnt out on drinking and would love to use up in this recipe. Sounds amazing!! Alexa!!! Thanks so much for tryign it out and the addition of sea salt = PERFECTION! I absolutely love being able to get extra protein in my diet in the form of protein powders; casein in particular. But a few years ago I became sensitive to the sweeteners they use in Optimum Nutrition Casein. They were the purest I could find, and I still use their creatine but had to stop the protein. Now I eat heaping piles of plain Fage greek yogurt three times a day : ) I’ve searched everywhere for a pure protein without added fake sugars. I checked out the three that you posted and it looks like they all have the artificial sweeteners. 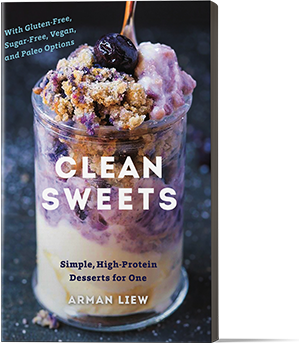 My question, since you seem to know about the healthier protein mixes available is this: are there ANY out there that don’t have artificial sweeteners or stevia? I thank you in advance for any information! Even if it is bad news of not having any protein powder options!! I have made ones with Hemp Powder and used 10 dates to sweeten it. The result is amazing ! Thank you ! Can you use collagen (high protein, none gelling kind) in leu of the protein powder? Hi Brittany! I haven’t personally used it so I can’t vouch for the results, sorry! Can I skip the protein powder? Does that change the consistency? Hey buddy thanks for the recipe! Mine didn’t come out nearly as good as yours but they were decent after a workout. I used 2 scoops Garden of Life Raw Protein Cacao and almond butter as suggested. Were you able to get a nice texture/crackly top with other protein powders besides what you linked? For some reason I think using peanut butter has something to do with the crackly top. How much protein and banana did you add exactly because I added a cup of mashed banana and it seemed too much. Ugh I just want to get this right but it seems the recipe leaves too much room for screwing it up. All your help is appreciated. Thanks for the reply. Yes I read the directions completely but I was hoping for more accurate measurements. For example the difference between 1 and 2 scoops of protein powder can give quite different results. Also with the bananas my 3 medium bananas came out much more than 1 cup. I’m wondering if that is why my brownies didn’t come out as good as yours. Also did you have luck getting crackly top with almond butter? Thanks again for your help. Hi, trying to calculate my macros with this, can you help please! 🙁 how many grams/ounce is a serving ?! Hi Brie! After you make this, slice it up into pieces and then you’ll be able to calculate based on how many you make. I don’t weigh the servings, sorry! What flavor of protein powder is best with these? The recipe says “1-2 scoops of protein powder (see above content for tested recommendations)*… so how much exactly should I use??? Hi Cheryl! You can use 1 or 2 scoops- Up to you! It comes out great either way! Sorry, not a fan. These weren’t even remotely sweet. Anyone who tries this add some sugar, honey, brown rice syrup, anything. And they don’t look anything like the photo. 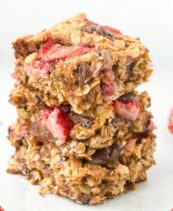 Any way to make these without using a nut butter? For peanut/tree nut allergic families? hi! 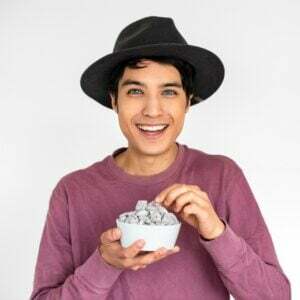 what is 2 T – 1/4 cup means? is that 2 tablespoon + 1/4 cup? thank you! Have you tried pb2 and water instead of regular peanut butter? I don’t have any of the regular stuff on hand and I want these TONIGHT!!!! I was considering the PB2 as well to lower the calories, but does that fat in the nut butter contribute in a certain way? What do you think it will turn out like if you used eggs instead of the peanut butter? My partner is allergic to nuts so I’m not sure what to use! Out of the different protein powders you used, was the vegan protein powder the best in your opinion? Hi I’m just wondering if you can use flour instead of protein powder? Hello! I noticed you mentioned 2 other protein powders, would those work just fine as well? But maybe not top quite as crackly? I am looking knot purchasing the paleo brand you mentioned. Oh my goodness these are amazing!! Followed your directions closely, refrigerated them overnight and my son and his friend had them for breakfast & raved about there yumminess…if that’s even a word:)) I just ate one and there so good it feels like a naughty treat, but they’re so good for you! I used Vega One protein and greens vanilla flavored 1.5 scoops, almond butter, 3 very ripe bananas and 1/4 cup Hershey’s sweet dark cocoa powder….yum!!! Hello!!! What brand for protein powder do you use??? The casein and brown rice ones work best! I was wondering if any one has used creatine powder and if it worked? I am sorry, I don’t know much about protein powders but these look good and I like that they are healthier than regular brownies. Amazing recipe. Thank you so much for sharing this. Will try this today. Can I use frozen banana? I tried this recipe and despite the fact that I SLIGHTLY overbaked the brownies, I believe that the main reason for their failure was the egg protein powder that I used. They turned out extremely hard and rubber-like. Hi Areti! I’ve never tried it with egg protein powder, unfortunately. I cannot vouch for how they’d turn out. Made them a couple of days back. They were so amazing. I watch my carbs and sugars as I am pre diabetic. This is a perfect recipe. Didn’t spike my blood sugar. Also, my 5 year old daughter loved it too. Will make them again. Thanks a million for this recipe. Oh fantastic- Thanks so much for the feedback, Megha! These are DELICIOUS! I used my QUEST chocolate protein powder and instead of using nut butter I substitute it with PBFit. High Protein and Low Fat. Taste Great! I used sunflower seed butter, special dark cocoa powder, bananas, and hemp protein powder…I also baked in a 6×9 and it turned into this amazing chocolatey cake from the gods. With…you guessed it…a perfect crackly top! Thank you SO MUCH! 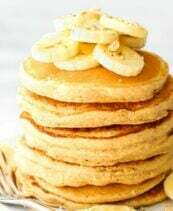 I tried making these but for some reason mine came out with an overpowering taste of bananas. It tastes almost like banana bread. I used 3 bananas and it was close to 1 cup and a quarter. Should I use less bananas? no sure how this can be vegan as most protein powders are made from dairy products? Hi Cazza, if you check out the post, this has been tested using a vegan protein powder (which is actually the one pictured too). Enjoy! 2 T – 1/4 cup cocoa powder means 2 cups + ¼ cup? Is that exact? Thanks! It looks soooooo goooood! Can’t wait to do the recipe! Hi Katie! It’s 2 tablespoons and up to 1/4 cup- If you want milder brownies, use 2 tablespoons. For richer brownies, use a 1/4 cup. Hey Arman! I just put these in the oven. I hope these turn out well! These look amazing. I’m just not a huge fan of bananas — does the flavor of bananas survive in the final product, or do you just taste chocolate-y deliciousness? just wondering can we opt out the bananas? Hi Emily! I’ve never tried it without banana, sorry! These look incredibly delicious. I love the cracked top too… makes me swoon. Congrats on your partnership with Kohls, that is freakin awesome!!! I’m allergic to all nuts, so what can I substitute for the nut butters? Would love to make these, as a celiac I can’t eat much of anything. Tried with a pea-protein based protein powder. Didn’t work well for us *this time*, but I think I might have overcooked it, which might explain why it didn’t become ‘fudgy’ in the fridge. To eat these, we put an orange flavored icing on top – not ideal….. Plan to try again. I just made these with a scoop of pea protein powder and a scoop of Greek yogurt protein powder. They are kind of meh and I can taste too much of the banana. Maybe apple sauce might work better. Thanks for the recipe though! Just want to update my earlier comment, which was for the brownies while still warm. They are much better cooled! I left them covered while I went out and now that they are cool the banana isn’t overpowering and the protein powders aren’t too noticeable. I think I would up the protein powder a little bit to see if they would be a bit less soft next time. Oh delicious!!!!!! 😀 So glad you enjoyed it, Marilyn! Would this work with hydrolysate collagen? Instead of protein powder? Wow! These brownies were amazing! I didn’t get the cracked top on top of mine though. I’m not sure what kind my protein powder was, but they still tasted awesome! Definitely a number one go to in my family. Thanks for this. 😀 That’s what I like to hear! Thanks for the feedback, Sara! Can I make these without protein powder? Do I need to make alterations if so? Hi there, I’m trying this from the UK… What measurement is ‘a scoop’ (for the protein powder). I have the American cups but not sure what the scoop refers to. Is it like a tablespoon? Thanks ! Can’t wait to try this receipe! What is the consistency of the batter ? Could you post a picture? I made these and they were awesome. I used optimum nutrition chocolate protein powder (whey, against the advice here) and they turned out fine. I also added a little honey to sweeten it up. I cut it into six pieces and they’re each about 220 calories with 10 grams of protein. What can I use instead of a nut butter ? Do you think this would work with PB2 as the protein powder? I haven’t tried that, but let me know how it works out! Made these today with crunchy peanut butter, hemp protein powder and organic cocoa powder. Wow, they are just fantastic! So easy to make and such a delicious pre-workout snack. Thanks for sharing the recipe. Can I use chocolate isopure protein to cook this brownies? What did I do wrong? The ones I made were dry and spongey :(. I used JRobb egg white protein. Is that why? It sounds like it, I only recommend casein or brown rice protein for these. These were delicious. I did use applesauces instead of bananas. Not my plan but when mixing up realized I was out of bananas. I will use bananas next time as probably choc goes better . Don’t really taste much of the applesauce but did turn out and is good. Thanks for a great recipe. Hi! What’s the role of the nut butter in this recipe? I’m thinking of using Better’N nut butter as oppose to regular peanut butter. It’s necessary. I haven’t tried with that before.